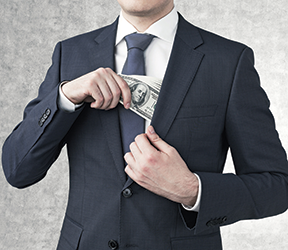 You suspect an employee is stealing: What now? Evaluate the situation. Determine exactly what is missing and what the cost of the theft is to your organization. Certainly, you will proceed differently depending on whether it’s a box of staples or several thousand dollars that has gone missing. Don’t jump to conclusions; consider possible explanations. Ask yourself if there is a plausible explanation for the missing items or funds. Determine if the theft is a one-time occurrence or took place over time. Thoughtfully consider who it is that you suspect, and if your suspicions are reasonable and objective. Observe and audit. Watch for any major changes or suspicious behavior. Conduct computer or financial audits. Make small changes to processes, routines, schedules, access privileges…anything that could make theft more difficult. Observe and document employee reactions. Keep it confidential. Announcing an investigation will put employees on the defensive and cause the thief to be more diligent in covering the crime. Thoroughly gather evidence. Collect all relevant information from personnel files to accounting records to surveillance videos. Hold off on the interviews. Don’t start interviewing until you have gathered enough data from your investigation to help form your questions. If possible solicit help from HR in interviewing witnesses. Create a paper trail. Document everything to clear up any ambiguity and protect yourself and your organization if the employee decides to take legal action. Note all your actions, record your interviews, and keep evidence organized. Be cautious. Never confront an employee one-on-one about theft. Always have a third party in the room…preferably an HR manager. The employee may take drastic measures. An accused employee may lash out in anger and threaten physical violence in or out of the workplace. Or the employee might try to undermine you quietly, by spreading rumors. In some instances, the employee may ask you to keep quiet about the theft. Don’t say or do anything that could make you an accomplice. The The SUPER adVISOR newsletter 2-in-1 newsletter provides HR pros with expert insight and advice to strengthen and reinforce supervisors' employee management skills. Contains pages dedicated to the HR manager and a corresponding four-page pullout dedicated to the needs of supervisors. Click here to sample this newsletter for free or view our full library of HR compliance publications.